Pharynx is a thin mucosal membrane lined cavity, which lies behind the nose and mouth and together with them, it opens into the esophagus. 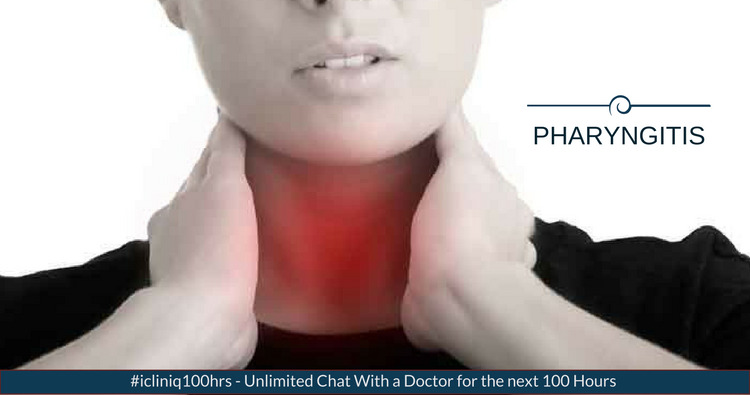 Pharyngitis can be defined as an infection or irritation of the pharynx or tonsils. The etiology is usually infectious of which most cases are of viral origin closely followed by bacterial infections. Some other less frequent causes include allergies, trauma, toxins and certain cancers. It is difficult to distinguish whether a particular event of pharyngitis is due to viral or bacterial infection merely on the basis of history and physical examination, though the causes are certain for acquiring the infections. The causes can be any of the following. Recent contact with a person having throat infection. Recent visits to healthcare places like clinics, hospitals, etc. Sudden change in routine environment or exposure to the allergens such as pollen grain, cat hair, etc. This is typical of allergic pharyngitis. Consumption of toxic substance, which deeply irritates the thin mucosal lining like caustic substances, spirits, etc. Physical trauma in the form of external deep injuries in the inner part of mouth or throat. This includes swallowing of foreign body substances like coins, stones, etc. Suffering from chronic illnesses like respiratory disorder, throat cancer, etc. Is it safe to take Atarax when pregnant? Fever of mild to moderate grade. Sore throat and itching sensation in the throat. Pain in the throat area. Headache with pain in the eyes sometimes associated with redness of eyes. Cough may or may not be present. If present with expectorations, then it is likely to be a bacterial infection. Generalized body ache and weakness. Maintaining a proper immunity level is a must to avoid getting such opportunistic infections. Besides, genetic predispositions of our body build its immunity cells based upon our daily habits, which include the food we eat, our stress levels, our sleep-wake cycle, exercises and sedentary habits. With its self-adjusting mechanism, our body forms its own defense line. Any sudden change or exposure to the non-routine atmosphere results in the symptoms. Maintaining proper dietary habits. Avoid frequent consumption of oil and fat containing food item. Fruits and vegetables in the daily diet provide the essential nutrients for our body to form the defense cells. Frequent heavy alcohol consumption must be avoided. A sleep-wake cycle should be maintained. Sleep of 6 to 8 hours a day suffices bodily needs. Avoid continuous sedentary habit. Mild to moderate exercise of about 1 hour daily would help a lot in pumping up of the defense cells in the body. If the person is a known allergic to a particular substance, then avoidance and protection from exposure to known allergen is the best call. Oral hygiene also plays equally important role in acquiring such infections. Twice a day brushing and cleansing of oral cavity helps avoid most bacterial infections. Do not self-treat or ask for medications at the pharmacy counter without doctor’s consultation. Do not wait for too long for the symptoms to subside. Do not stop the prescribed treatment without consulting the doctor. Stopping the treatment in the mid would leave the infection unresolved and the person may get sick again. Be responsible enough not to expose other people, especially children, to your infections by sneezing, coughing in the public places without covering your nose and mouth with a handkerchief. Follow a healthy and nutritious lifestyle. Consult the doctor on time and complete the prescribed treatment course. Viral origin pharyngitis as such has only symptomatic treatment. It is mainly because antiviral medications are not recommended for such infections. These infections usually subside by themselves within a few days. Bacterial infections must be treated with antibiotics, which are chosen by the doctor. He chooses as per the requirement and suspected etiology. Taking any random antibiotic might worsen the symptoms or might not resolve the infection completely leading to relapse. Over the years, studies have shown that because of the constant abusive use of antibiotics the resistance among the bacterias have increased, making it difficult for us to treat the infections. Allergic origin has to be treated with antihistamine drugs, which alleviate the allergic effect of the allergens. Antibiotics have no role in this scenario as such. Proper choice of antihistamines is also important because many of them are known to cause sedation, which would affect the person's day-to-day life. Hence, consultation with a proper doctor will help in choosing a proper drug treatment according to the scenario. For a cause like toxic origin, the main aim remains to get rid of the toxin and hence, its bad effects along with other medications as adjunctive. In the case of cancer, oncological consultation will help in reducing and resolving the symptom. So, the bottom line is that treatment for any kind of symptom demands attention and consultation with a qualified doctor in order to get terminated. Do you have a question on Ent or Antibiotics? The entire surface of the fetus is fluid-filled. What does it mean?